the largest historical reconstruction of its kind in North America. Walk the streets where world powers fought for control of a continent. French soldiers march through the streets of the town as ladies and gentlemen dance in formal parlours. Cannon fire shakes the ground as harpsichord tunes mingle with baking bread aromas drifting from the stone bakery. 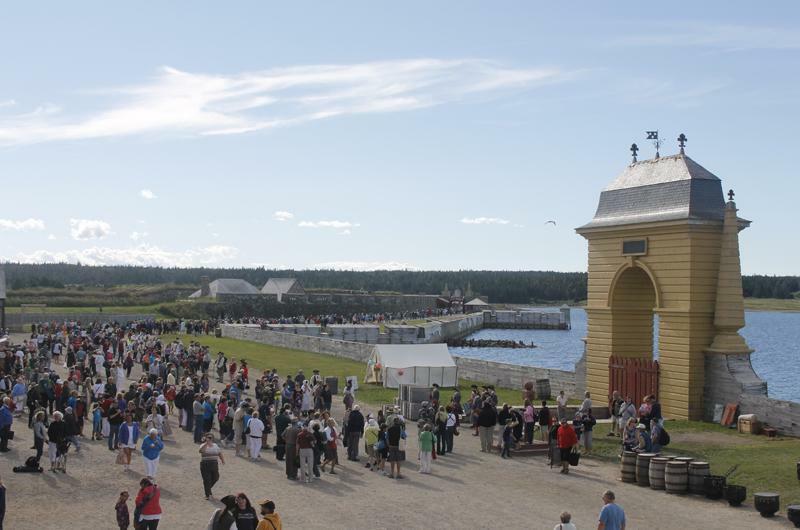 Step through Louisbourg’s fortress walls travel back in time to the 1700s. Nova Scotia’s colonial history was largely shaped by decisions far across the Atlantic. When the War of Spanish Succession was settled with the Treaty of Utrecht in 1713, Britain was given control of mainland Nova Scotia and France was given Ile Royale, what is today known as Cape Breton Island. On the eastern side of Cape Breton, the French found an ice-free, sheltered harbour to act as a base for France’s interests in the cod fishery and to serve as an important trading outpost because of its proximity to Europe and colonies in both New England and the West Indies. They named it Louisbourg, in honour of King Louis XIV. Over the course of almost three decades, engineers surrounded the town and garrison with massive stone walls that would make it one of the most extensive fortifications in North America. In fact, the 4 kilometres (2.5 miles) of walls – measuring 30 feet high and 36 feet thick in some places – cost so much to build that the French king joked how he expected to be able to see them from his palace in France. Despite the towering walls, the Fortress of Louisbourg had some weaknesses that its engineers struggled with. While the fortress was well defended against attacks from the sea, it was vulnerable to land-based assaults, and when France and Britain went to war in 1745, this weakness was exploited. The attackers – New England militia who saw Louisbourg as a direct threat to their colonies and the nearby fishing grounds – erected siege batteries on the hills overlooking the fortress and, through a series of bombardments and assaults, forced the defenders to surrender. Even with its proud military heritage, the Fortress of Louisbourg was about more than just the military. At its core, Louisbourg was a thriving civilian community made prosperous by a profitable cod-fishery and strong trade ties reaching across the Atlantic. During its peak it was the third busiest port in North America and was considered the jewel of France’s holdings in the new world. Louisbourg represented hope, and its prosperity convinced many of France’s poor and impoverished to leave their homes behind and seek a chance at a better life. The Treaty of Aix-la-Chapelle in 1748 returned Louisbourg to the French. It also prompted the British to establish a new fortress at Halifax to counter the French presence in Cape Breton. Over the next decade, French and English forces battled for control of Nova Scotia during the French and Indian War and the Seven Years War. The Fortress of Louisbourg fell once again in 1758. This time, British engineers destroyed the town and dismantled its fortifications, shipping some of the stone off to Boston to construct Louisbourg Square and other buildings in that city. The Fortress of Louisbourg might have been lost to history had it not been designated a National Historic Site and partially reconstructed in the 1960s. It has become the largest reconstructed 18th-century French fortified town in North America, with archaeologists, and engineers and historians working together to recreate the town as it was in the 1740s.era. Today, the modern town of Louisbourg welcomes travellers from around the world with an amazing fortress, spectacular walking trails, fishing wharves along the winding Havenside Road, exceptional music and theatre at the intimate Louisbourg Playhouse, and fresh seafood to savour. Absorb the beauty of the surroundings, have a picnic at Lighthouse Point (site of the first lighthouse in Canada, 1734), stroll along the beaches at Kennington Cove, and don’t miss the Sydney & Louisburg Railway Museum. Stay in one of a number of friendly local accommodations, ranging from inns, suites, and bed and breakfasts to campgrounds and cabins. You can also spend the night inside the fortress walls by camping in one of the historic homes or rent a period tent with all the equipment. Visit in the summer (July 1 to September 4, 2017) to feel the ground shake from the blast of the cannon you’ve just fired. Savour soldier’s bread fresh from the stone bakery or the catch of the day in the ambiance of an 18th-century tavern. Discover the taste and aroma of Fortress™ Rum and the story of this drink made from sugar. Chat with fishermen, merchants, sailors, soldiers, and servants. Explore the beautiful beach and scenic hiking trails nearby. Dare to stay after dark for our murder mystery or for an overnight experience in a period home or a fully equipped 18th-century-style tent. Visit in the spring (May 22 to June 30, 2017) or the fall (September 5 to October 9, 2017) to explore what life was like 300 years ago with our Time Travel experience, a taste of Fortress™ Rum, a guided tour, and more. Hunt for one of our geocaches, using your GPS device throughout the site. Marvel at the stunning views of both the sea and the Fortress from one of our hiking trails (open throughout the year). Visit in the winter (October 10, 2016 to May 21, 2017) to discover the exterior architecture of the Fortress’ reconstructed buildings. Stroll through the streets and backyards of the town and imagine what your life here would have been like back then. Download the free Explora App, available for both Android and Apple devices. It features audio tours of both the reconstructed town and the area of the Fortress that still lies in ruins. Whether you’re strolling through the town’s streets or simply sitting in front of a crackling fire, you’ll truly experience life as it was in the 18th-century. Don military regalia as a colonial French artillery student and learn to fire a cannon as they did 300 years ago, or sign up with the Compagnies Franches de la Marine to get a soldier’s basic training and fire an exact replica of an 18th-century musket. You can also play the role of the prisoner during the Public Punishment. Costumed staff in period restaurants prepare and serve delicious food and beverages based on 18th-century traditions and recipes. Discover the taste and aroma of Fortress Rum and learn the story of one of the most popular drinks of 18th-century Louisbourg at a Rum Tasting.